Be the first to share your favorite memory, photo or story of Anna . This memorial page is dedicated for family, friends and future generations to celebrate the life of their loved one. 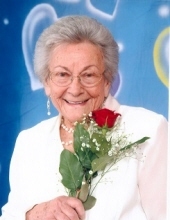 Anna Nadine (Kinney) Overton, a long-time resident of the Kansas City, Kansas, died Wednesday the 3rd of April, 2019 in her home. Born in 1928 in Branch, MO. Nadine completed the 8th grade and later in life got her GED. She also graduated from secretarial school and worked at Macy’s in the executive offices. She and her husband were long time business owners in Kansas City, Kansas. Nadine has dedicated her life to Christ and served in the church as a Sunday School Teacher, Board Member, and Finance Department. She also loved going to sewing club teaching other young women how to quilt. She is preceded in death by her husband, William L. Overton Sr., her parents, Rebecca I. (Nations) and Joseph E. Kinney. All of her siblings and their spouses; Lavonia, Joe, Dave, Jack, Wilbur, and Bill Kinney. One grandchild, Heather R. Wiles. She is survived by children William L. Overton Jr. (Susan), Rebecca M. Overton-Ogaga (Christian) and her step-children Vickie L. Letterman (Jerry) and Deborah K. Overton. She has 5 grandchildren: Joshua J. Overton (Erin), Trenton S. Overton (Lacey), Onri A. Anderson, Alyssa Overton, and W. Blaine Overton. She leaves behind 11 great grandchildren and a host of nieces and nephews. To send flowers or a remembrance gift to the family of Anna Nadine Overton, please visit our Tribute Store. "Email Address" would like to share the life celebration of Anna Nadine Overton. Click on the "link" to go to share a favorite memory or leave a condolence message for the family.